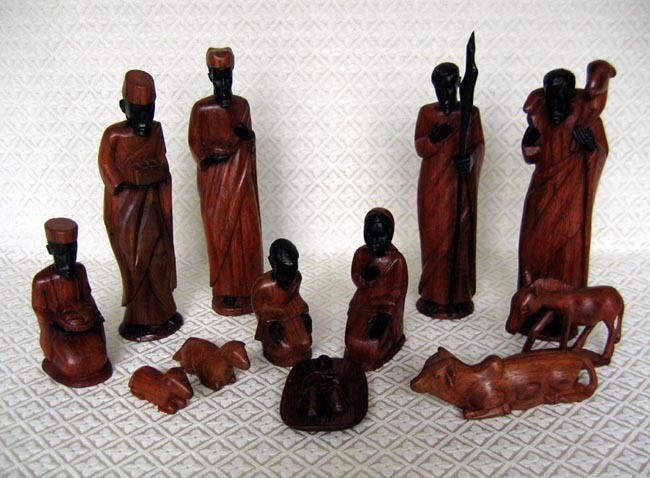 This Nativity set from Tanzania was carved from both rare ebony and maninga woods; the heads and hands are black ebony while the bodies are maninga. The set contains 12 figures: Joseph, Mary, baby Jesus in a manger, two shepherds, two sheep, a donkey, an African zebu (cebu) cow, and three wise men. The tallest standing wise man measures 9 inches tall. The set was carved by a faithful group of young men who are raising their own families, plus often raising children from relatives who have died prematurely. Their Nativity set is an opportunity for the young men to share their love of God with others in a very tangible way.